TigerText has launched a new secure, HIPAA-compliant, messenger service for web portals and mobile applications which automates a wide range of tasks that previously required the time of support staff. All too often patients face extended wait times when calling hospitals and other healthcare facilities and hold times in excess of 30 minutes are far from uncommon. Obtaining answers to questions and making routine appointments is rarely a quick process, causing considerable frustration for patients. Patient web portals are a convenient way of communicating with patients more efficiently, yet healthcare staff are still required to man the web portals. Many of the questions asked by patients via web portals can be easily handled by a messenger bot. Automating these services can reduce patient waiting times and provide patients with instant answers to their questions. With the cost of healthcare expected to increase by 5.8% each year, healthcare organizations need to find new ways to improve efficiency and lower operational costs. Messenger bots can allow patients to receive information faster, without having to pick up the telephone. 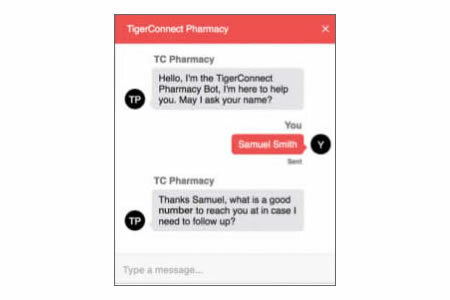 The new TigerText HealthBot uses the natural language processing and structured conversations of the TigerConnect secure messaging platform to automate tasks such as appointment scheduling, routine information gathering, the provision of drug interaction and side effect information, and the issuing of reminders to make appointments, take medication, and renew prescriptions. Patients can interact with the HealthBot via a chat window. Answers to common questions can be programmed into HealthBot to enable patients to obtain quick answers, while certain replies to patient questions can be programmed to trigger questions that can help determine whether patients’ conditions require the immediate attention of nurses or physicians. All information exchanged via the TigerConnect HealthBot is encrypted to protect the privacy of patients and ensure compliance with HIPAA Rules. The platform is flexible and can be adapted to suit healthcare providers, health insurers, and pharmacies and can be embedded into websites and a wide range of applications. Health insurers can program answers to common questions about insurance coverage, while pharmacies could use the HealthBot to take prescription refill orders and issue confirmations to patients to tell them when and where medications can be collected.